Mantilla-twitch to A Thorn in the Pew. Twitch of the mantilla to Mark. Fr. 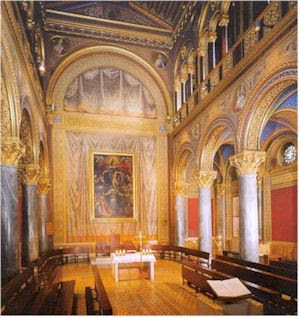 Ray Blake has a post on the state of things at the Venerable English College in Rome - unfortunately, it seems that all is not as it should be. It would appear that the powers-that-be at the VEC are stuck in a time-warp somewhere around the 1970s, and they refuse to recognise that the students welcome a more traditional approach to their formation, and still less do they acknowledge the authority of the Holy Father. For example, the English College students are allowed to wear a cassock for ceremonies outside of the college but not in it. I can hardly believe how ridiculous this rule is. Pope John Paul II instructed all students in Rome to wear clerical dress when they went out in public. How much more should they be allowed (note I say "allowed" and not "forced") to wear traditional priestly garb for major ceremonies in the College (or anywhere else?) The enforcement of an arbitrary ban of this sort encourages an attitude of disobedience towards one's superiors (if not actual disobedience) which is hardly the sort of attitude one would wish to foster in men training for the sacred priesthood. This completely ludicrous approach was compounded by the extremely ill-mannered instruction to guests at a recent ordination not to wear a cassock. I would also be interested to know whether the people who thought up this "dress-down" code also issue instructions to female members of the congregation who wear either unsuitably short skirts, indecently low tops or very little around the midriff (or occasionally a combination thereof) to dress more appropriately for Sunday Mass? I am not the happiest of bunnies... I tried to buy a book online earlier (a new Chemistry book, as I think I need to do some extra reading over the Summer) and got a message back from Amazon telling me that the transaction had been declined. I wasn't too happy, but Amazon had had a few glitches during the day, and I didn't think anything more of it. I rang the bank. The operator asked if I wanted a new PIN to unblock the card. No, I explained, I wanted to know why the card had been blocked in the first place. I was told that I had entered the incorrect PIN number too many times. I told the operator that I jolly well had not put in the wrong number, not even once. She then told me that the card must have been blocked by a faulty machine, and that a new PIN number would be all I needed to get the card working again. I was starting to get a little frustrated by this point. I felt that she wasn't actually listening to what I was saying, but was reading from a prepared script. I pointed out that I hadn't used a machine until this evening, after the card had been blocked (illustrated by my declined Amazon purchase.) After first trying to fob me off with the claim that she couldn't tell why the card had been blocked, she then changed her tune and said that someone in Scarborough had tried to pay for items using the card, but the PIN had been incorrect, and the card had then been blocked. So, now did I want a new PIN number to be issued? With difficulty, I explained that I was very concerned about the integrity of the card - if I asked for a new PIN, surely the person with the cloned card had a possibility of getting the correct PIN number, by pure chance. There was also the problem of the internet... no-one asks for a PIN number online, just the card number. And what if they tried to sign for stuff using my card...? However, I shall also make a little trip to my nearest branch and make my displeasure known! Mantilla-twitch to Mark for spotting this one!